« Welcome to SMALL CROCHET! My very nice father-in-law gave me a GPS for Christmas (I had been going on a trip to Arizona, a 16 hour trip one-way, and I’d never driven before, and he was worried I’d get lost in the desert… awww!). In attempting to figure out a way to keep it with me, yet not have it be killed in my purse, I decided AHA! 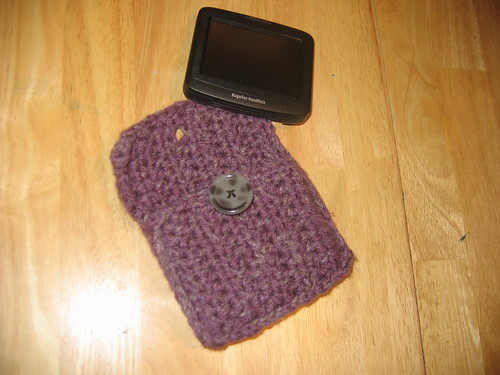 GPS Cozy! I had been SO WANTING to use my lovely heathery purple wool, a gift from the last Knit (& Crochet) Out I went to, but it’s very itchy and VERY thick, and so not a good choice for scarves and such, at least not to my taste. I had the Vanna’s choice that matched very nicely, so I combined them.This was a simple pattern I made up, just a rectangle of hdc (half-double crochet) stitches long enough to be able to wrap like an envelope around the GPS unit, and enough rows so I could have it be snug, and have enough room to sew up the sides. I skipped a stitch (hdc, ch1, skip stitch, hdc as usual) to make a button hole, then found a nice big button. I whip-stitched the sides shut, then whip-stitched for looks around all the edges. The combination of the two yarns made it so the scratchy wool wouldn’t damage the screen (really, it’s that rough, but so pretty – the pictures don’t do it justice! ), and it’s nicely padded. This took about 2 hours all-told, and I felt extremely geeky when it was done, but it has really done it’s job! so cute! 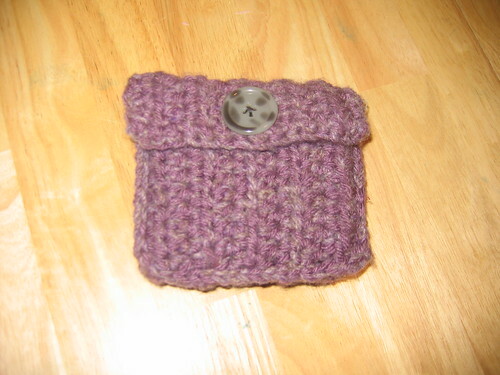 ….love the color AND the little button. Plus, great minds think alike, I made a green one for my phone awhile back too! u MUST consider a magnetic clasp! I have one on mine and it makes all the differnce! and mine is black~which matches the gps and looks like a classy (not geeky)clutch!